Take a fun and scary ride on Ghost - The Haunted House - if you dare! 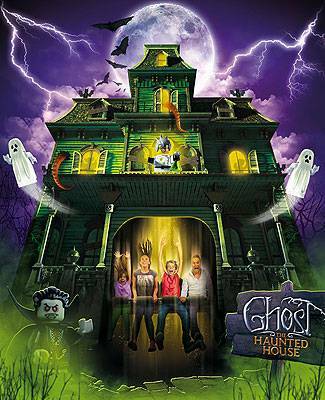 Ghost - The Haunted House is horror, shocks and laughter for the entire family. UUuuuhhhHH! Make a note in your diary! At LEGOLAND® we once again invite you to attend lots of exciting events. There's fun for the whole family. Throughout the season, we present popular stars and new talent. You can enter fun competitions and take part in other challenges using your brain, your body and your imagination. Keep track on LEGOLAND.dk. Take a fun and scary ride on Ghost - The Haunted House. Sneak inside The Haunted House, which is crawling with vampires, ghosts and monsters. You can chase ghosts in the enchanted mirror maze and meet The Crazy Scientist and his mad experiment that will send you and your brave family floating and perhaps even drop youuuuu....! You can also look forward to a reunion with all the LEGOLAND® activities you know and love. Keep a cool head as you whiz through Polar Land on an awesome snowmobile with the Polar X-plorer rollercoaster. This ride has a unique 5-metre drop that will turn your blood to ice. Get to know our colony of real live penguins in Penguin Bay. Explore the fascinating Miniland and experience an amazing world made entirely of LEGO® bricks. Bake twist bread with our American Indian. Are you trigger-happy? Shoot your way through the scary and stunning TEMPLE in your search for secret treasure. Join the submarine down with the sharks and monster crabs in Atlantis by SEA LIFETM. There's speed, action and excitement for the whole family at LEGOLAND®! There are more than 50 exciting activities and a full programme of fun events to look forward to.